WWKIP Day at D’Art Center | Stitch, Brinn, Stitch! Today was a WWKIP (World Wide Knit in Public) Day event at the D’Art center in Norfolk. I went and though I didn’t take any pictures (cause I don’t really know anyone and I feel weird about snapping random photos of people) I did have a lot of fun. I finished a pair of socks (which I’ll post about later) and worked on my WWFY sweater. I also got lots of swag! 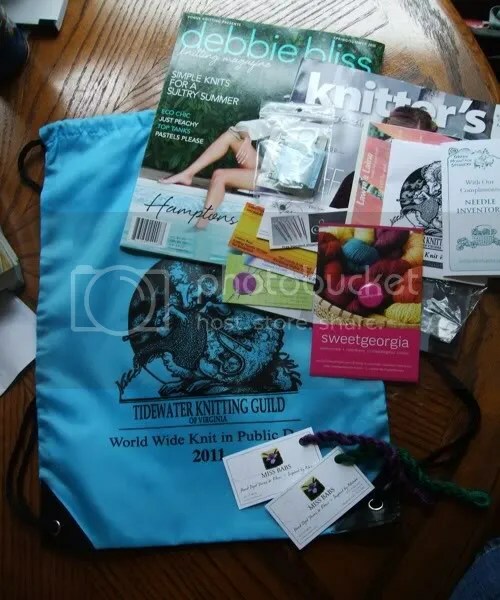 A bag, some mags, a button, some samples of Miss Babs yarn, a Euclan sample, and some coupons/business cards. I’m never thrilled with Knitter’s, but there are a couple of cute things and there’s a dress in the Debbie Bliss mag I might make (out of cotton, not pure silk like suggested cause I’m not crazy). There were probably about 50 people there total. I sat with a group of lovely women who welcomed me (as I’m sure I looked SUPER confused upon arriving, not knowing anyone there). Of COURSE I didn’t get their names, but they were lovely. I sat down, pulled out my sock to knit and started to flip through the Knitter’s mag. One of the women there (not at my table but wandering around) came over, saw me flipping through the mag and said, “Oh, I have to give you something! I’m with Knitter’s and you’re actually looking at the magazine!” So she gave me a Juniper Moon Fiber Farm button (yay!) and a tape measure. Everyone who came got a ticket for a door prize drawing (there were a LOT of prizes), two if you brought a charity knit (I didn’t but I SHOULD HAVE). They drew a bunch of tickets every half hour or so. I had arrived at 12:45. I left at 4:45. I kept listening to the numbers–not mine, not mine. Finally, the Knitting Guild President (the sponsor of the event and the woman who was running things) said, “Is there anyone who’s still here that hasn’t won something?” I raised my hand. 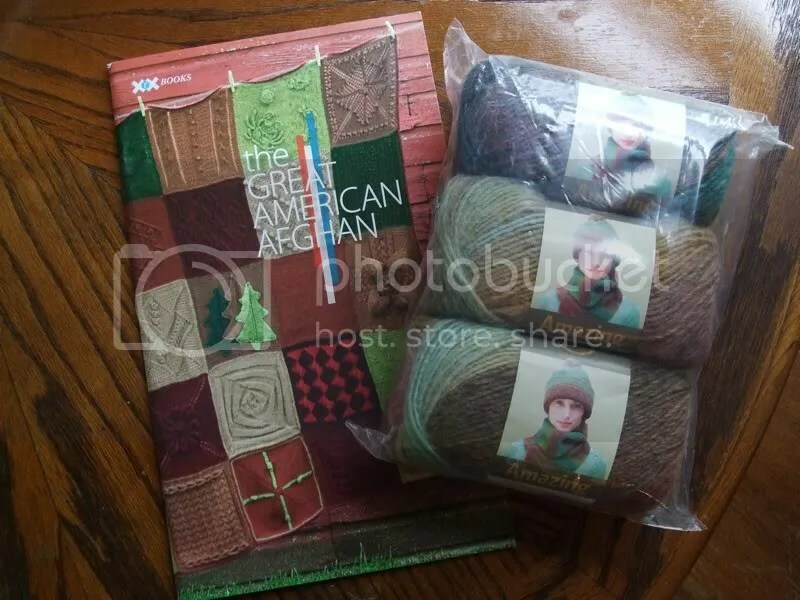 I’m not crazy about either but I’m thinking I can trade the book and the yarn will probably be a shawl or scarf of some kind. I don’t especially care for the 47% acrylic, but I’ll deal. After all, I won it! It was nice to hang out with other knitters who know what they are doing, can knit more than garter stitch and know what ssk, MadTosh, and US 6/4mm mean. I had a lot of fun and I will definitely be looking for more KIP events in my area next year. I will happily take that book off your hands for either cash or a trade in yarn or books. I’ll be updating my stash page on Rav this week but my library is up to date. PM or email me and let me know. I actually made a triangle striped shawl out of the Amazing for someone and I ended up liking it enough that I almost kept it. And I am jealous your WWKIP day has swag! !